Figures from the footballing world joined thousands of fans to bid farewell to Celtic legend Tommy Burns at his funeral in Glasgow. Manager Gordon Strachan and the entire Celtic first team squad attended the service at St Mary's Church in the Calton area where Burns grew up. Hundreds gathered outside the church and thousands more listened to the two-hour requiem mass at Celtic Park. The funeral cortege stopped at the ground on its journey to Linn Cemetery. 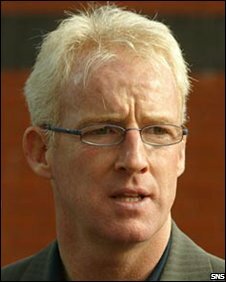 Tommy Burns died from cancer on Thursday aged 51. His coffin was carried into St Mary's by former Celtic team-mates Danny McGrain, Peter Grant, Pat Bonner and George McCluskey. Rangers manager Walter Smith and his assistant Ally McCoist, who were part of the Scotland international coaching set-up with Burns, were also among the pall-bearers. Scotland's First Minister Alex Salmond has also attended the funeral. Other figures from the football world who arrived to pay their respects included Everton manager David Moyes, Motherwell boss Mark McGhee and former Celtic manager Martin O'Neill. Former Celtic players Roy Keane, Kenny Dalglish and Pierre van Hooijdonk were also there. In a eulogy, former Celtic team-mate Billy Stark described Mr Burns as a "unique and special man". He said: "A list of Tommy's wonderful qualities is endless - a dignified man of principle, his generosity of spirit knew no bounds. He showed great compassion for those less fortunate than himself. "Tommy Burns treasured three things in life above all others - family, faith and football, particularly Celtic Football Club. "You would see him on the training ground in the morning, demanding and driven. When he returned from the lunchtime visit to the chapel, he turned into a calm and serene man." In his sermon Monsignor Tom Monaghan, parish priest of St Cadoc's Church, Newton Mearns, said: "There can be few families who have received the number of condolences upon the death of a treasured member of the family, as the Burns family. "Although they knew his days on earth were drawing to a close, still the pain of loss kicks in and they would have wanted to hold him just one more day, just one more minute. "The ordinary people of Glasgow and beyond have joined with supporters of Celtic football club and indeed of rival football teams to express their regard and affection for Tommy." As the service got under way, thousands of Celtic fans who had engulfed the streets around Celtic Park stood in silence. Individuals, couples and whole families had made the journey to say farewell to the man they all acknowledged as a Celtic legend. 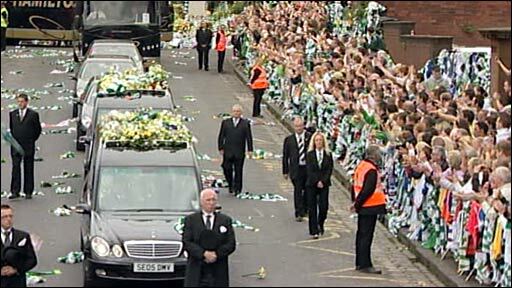 The mourners crossed the generations of the Celtic family. George Inness, from Maryhill, said he totally identified with Burns. He said: "Tommy came from the same background as I did. He came through the ranks and he lived the dream. I'm just emotionally struck at this time." Elizabeth Snape, from Holytown, North Lanarkshire, said: "We just wanted to pay our respects. He was a really nice guy and Celtic through and through." Danny Carlington, from the city's south side, said: "I felt totally compelled to come here just because of the man himself and what he meant to so many people." After the service, the funeral cortege made its way through Gallowgate and past Celtic Park before heading to Linn Cemetery. Tommy Burns was treated for skin cancer in 2006, but the disease returned earlier this year. Since his death was announced last week, the outside of Celtic Park has been turned into a shrine.